Module A-183-2 is a simple voltage offset generator combined with an attenuator/polarizer for the CV input. 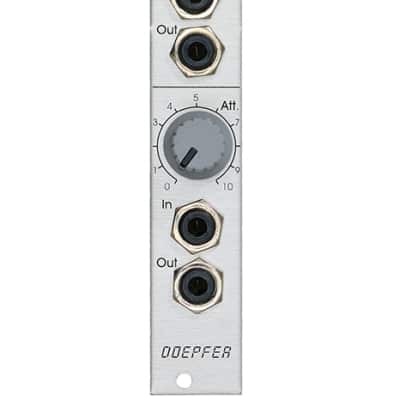 The function is similar to the vocoder slew-limiter module A-129-3. But the A-183-2 has only one channel available and does not offer the slew feature. Instead of that module A-183-2 offers another feature: switching between attenuator or polarizer function for the input control. This is how the A-183-2 works: At the two output sockets (simply two connected sockets) appears a DC voltage that is adjusted with the Offset control in the range 0...+5V or -5V...+5V. An internal jumper is used to select the offset range (0...+5V or -5V...+5V). Other ranges are possible by changing a resistor on the pc board (e.g. 0...+10V or -10V...+10V). The DC voltage generated by the Offset control is overlaid by the attenuated voltage that is fed to the In socket. The function of the attenuator control can be set to Attenuator or Polarizer by means of a toggle switch. When the switch is in the Attenuator position the control works as an usual attenuator, i.e. zero level at the fully CCW position and max. level and the fully CW position. When the switch is in the Polarizer position the control works as a polarizer, i.e. zero level appears at the center position. Right from the center position the In signal is added to the offset voltage, left from the center position the In signal is subtracted from the offset voltage. In other words: at the fully CW position the non-inverted In signal is added with the full level to the offset voltage, at the fully CCW position the inverted In signal is added with the full level to the offset voltage. The amplification range for the input is about 0...+1 in the attenuator mode, and -1...+1 in the polarizer mode. The amplification range can be modified by replacing a resistor by another value. Generation of adjustable DC voltages overlaid by control voltages with adjustable level and polarity to control other modules that do not have attenuators or offset controls, e.g. Sampler A-112 (mainly for the wavetable mode), dual VCA A-132-1, Quantizer A-156, Theremin A-178, CV-to-Midi interface A-192 and modules of other manufacturers). The pin header for the jumper that is used to select the offset range is located between the Offset and Attenuator control on the pcb. In the upper position of the jumper the offset range is 0...+5V, in the lower position -5V...+5V.